The AbouEzzi family name, which means "father of pride", originated in the early nineteenth century in the Bekaa town of Kherbit-Qanafar in Lebanon. 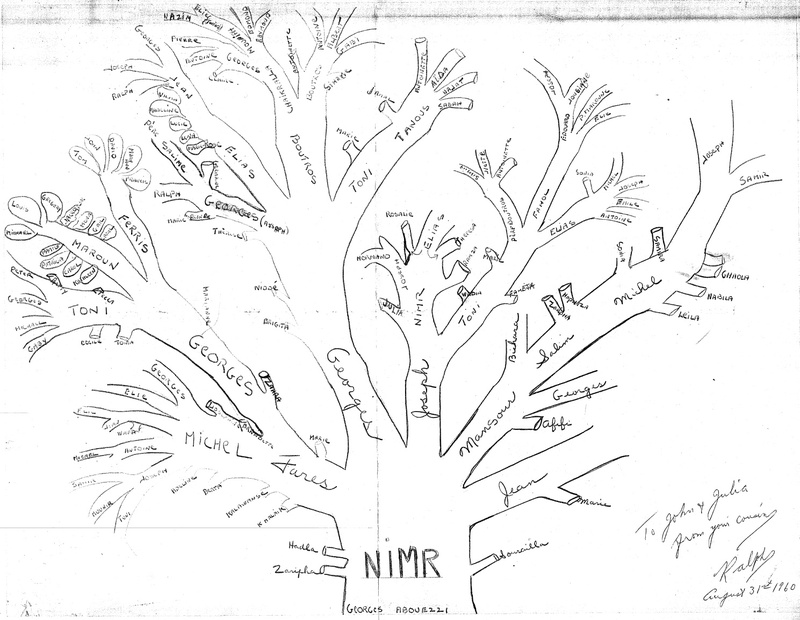 Nimr (means tiger) AbouEzzi was the first to adopt this family name, and we are now upon the sixth generation of descendents (Andrew-2002 , Salim-1963, Samir-1935, Michel-1910, Salim-1884?, Mansour-1855?, Nimr AbouEzzi-1820? ), which suggests an estimate for Nimr's birth in the early nineteenth century (giving a generation 25 to 30 years). 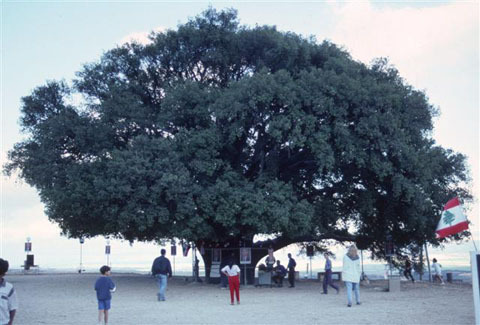 The complete family tree is well known thanks to early efforts by Ralph Assaph Azzie of Ottawa Canada. How did the AbiEzzi name evolve from AbouEzzi? Kherbit-Qanafar is a small farming town in the south-west Bekaa region of Lebanon, situated in the eastern foothills of the Chouf section of Mount Lebanon, overlooking the fertile Bekaa valley and the Litany river. Early members of the family where born there, farmed its lands and hunted its hills. It has an irrigation stream called Ana AbouEzzi, since it was dug by Nimr and his sons to water their fields. It is presently part of the prosperous wine region of Lebanon. The name is suggestive of an ancient town, since "Kherbit" means "ruins", "Qanafar" has Greek roots related to "light house". The story is that the ancient town had a light house on its hill to guide travelers. A narrative in the family tradition suggests that the father of the family, Nimr AbouEzzi, changed his last name from Eid after he fled from authority with a brother to the Bekaa region, from Mazraet-el-Dahr in the Chouf region. This narrative was disproved in February 2009 through DNA testing jointly with members of the Eid family from said town; see family tree project below. Therefore, Nimr's original family becomes an open question, which we hope this project will help answer. Immigration to the new world including to Canada, USA, & Brazil occurred in the early twentieth century and later upon the Lebanese civil war in the 1980's. Among the early immigrants we know of Mariane who lived in Maine and Ralph who lived in Ottawa Canada. Many immigrated to the Cleveland area, where the Kherbit club is based. Many of those who immigrated to the USA and Canada morphed their last name to: Ezzie, Azzie, Ezzy, Ezzi, Ezze, etc. A search of the US social security database shows more than a dozen deceased individuals throughout the USA with the Ezzie last name. The family tree came a long way thanks to Ralph's initial work, my cousin Michel Antoine's effort, and updates from different family members. To view it you need the free Simple Family Tree Windows application (item #5 on this web page). Download the AbouEzzi GED file (right click the link and choose "save as"), then run the application and open this GED file. Click on any person's name to see their relations in the tree! Certain persons have information in the notes section, which you can see by right clicking the person. Please email me with any updates, including salient notes about members of the family. I will update the tree on this web site after major updates to the master version. Note that this is a surname tree, so it includes women whose maiden name is AbouEzzi (or a morph thereof), but not their spouses or children. These names could be included in the notes section. In 2012 I was contacted through this web site by Tony-1978 (Gabriel Anthony George Ferris Nimr) Ezzy a musician in Montreal, Bill-1972 Kennedy (descendent of Brijeta George Nimr) a TV producer of Ottawa, and Joe-1940 (John Elias George Nimr) Ezzie of Akron OH. They all provided me with valuable updates to the AbouEzzi tree and material for this web site. Joe's grandmother Affifi is sister of my father's grandfather Salim, which makes them second cousins! Around 2005, upon a Google search on "abiezzi" one of the couple hundred resulting hits showed an Italian family of this same last name! More recently I received a Facebook message from Attilio Abbiezzi after he came upon this FamilyTree project. "Hi! I read your story of the "abou-ezzi/abiezzi" family. I am from italy and my surname is ABBIEZZI (with double B): maye there is some relations?" By doing a Facebook search on "Abbiezzi" six Italian individuals turned out. Are the names a coincidence or are the two families genetically linked? The answer lies in our DNA. In 1953 my grandparents- Zahra ( not Zambra) and Tanios Abou Ezzie came to the US to visit their daughters Fahda and Wadia Thomas. If you look on the family tree, Zahra is the daughter of Ferris Abou Ezzie. Tanios is the son of Yousef Abou Ezzie. My Grandfather was from Lebanon. His name was Elias Gloria Isaac. He arrived here in 1914 with his brothers Camilo y Salomon. His surname was translated to Spanish language when they arrived by himself and his brothers. My dad and uncles, told us that the real surname had a sound as Abouez, or something similar but they didn't know the exactly word. The Grandfather died when dad and uncles was about 8 to 10 years old. We don't know the real surname, but reading in your web page, you are looking someone Abou-Ezze. I don't know what means "ezze", but I know that Abou means "father" and for example the surname Abdul-Mu'ezz means "servant of Giver of glory"
The word Abdul in Lebanon is equal to Abou. Means "father". In other regions is Abul and in jewis is Abba. The prefix Ab in semitic languahe means "father"
The point is that maybe the surname Abou-Ezze was the real of my family in Lebanon. Dou you know something more about it? My grandfather Michel Salim AbiEzzi (born in 1910) is the first to have this variation of the last name due to a typo when his ID was handwritten, a typo that stuck and now is inherited by three generations of descendants! My uncle Joseph Michel AbiEzzi was the first to immigrate to the US from the AbiEzzi branch of the family back in 1970, he obtained a mechanical engineering degree from the University of Lowell in MA. Thanks to his pioneering work, now all his six siblings and every member of their extended families are happily living throughout the US (WA, CA, VI, MA, OH, IL, etc). The science behind using DNA for genealogy has come a long way; check the Family Tree DNA information page. I setup the "AbouEzzi DNA" project with FamilyTree, which currently includes half a dozen participants. When new members submit their DNA results (I suggest the Y-DNA67 test for about $250), this online service will show them how their DNA correlates with those of existing members. Based on this correlation there is a formula that indicates the time-frame for the Most Recent Common Ancestor (MRCA). Michel Antoine Michael Fares Nimr AbouEzzi and Salim Samir Michel Salim Mansour Nimr AbiEzzi are confirmed to be paternally related. Michele and Salim have only one variation out of 67 markers, which seems to have occurred on Salim's side of the tree. Contrary to the narrative, the AbouEzzi's are not paternally related to the Eid's. In fact the two families are in two different Haplotypes: the Eids are in J1 while the AbouEzzis are in J2. According to the well publicized work of Dr. Zalloua, the J1 Haplotype is traced to Arab origins and J2 to Phoenician origin. The Phoenicians and Arabs are related in that they both have Semitic origin; hence, the Eids and the AbouEzzis are related after all, but we need to go back a few thousand years. The AbouEzzis are of Phoenician decent, which makes their Lebanese roots go back thousands of years. The find in #2 keeps open the question of ancestry of the AbouEzzis before Nimr. DNA results suggest that the AbouEzzis have a common ancestor with a Lebanese who lived in Mobile Alabama in the 1930's, we're trying to figure out his identity and family background. There couldn't be that many Maronite Lebanese who lived in Mobile in the 30's. Ferneini from Junieh is one of them. Also we hope for more leads through the "AbouEzzi DNA" project to crack this puzzle and find lost cousins. 1- Confirm the known family tree by correlating DNAs of individuals from each main branch of the tree. 2- Determine the ancestry of the AbouEzzi family (now that it is fairly proven that there is no link with the Eid family). 3- Re-connect with members of the AbouEzzi family who immigrated long time ago and lost touch and perhaps changed their last name. 4- Identify males who where sired by an AbouEzzi but who no longer carry the name (adoption, out of wedlock birth, etc). 5- Clarify the deep history (tens of thousands of years) ancestry of our family through continued progress by the Genographic project. This could be a collaborative project where many could shed light on the history of our family. The best part is that the results will be shared worldwide through this page and the Internet, and will be available for the benefit of future generations. Interview seniors of the family for more details about our origin, immigration to the new world and other stories about the old generations. Email me your reports, which I will incorporate with this web site as appropriate. Please try to be specific with the source of the information, dates, names, etc. If you have journals, interviews, photos of members of the older generation, please consider emailing them with dates of birth and death. Review the information on this site and email me with any corrections or additions. Join the AbouEzzi genealogy project and submit your DNA for testing. I suggest that you request a 67-marker Y-STR test kit for best results.